This is going to be my first nail post ever. For those who don't know me, I normally have clean short nails and I rarely use color. If there's a need to attend a special occasion and I have to be wearings sandals, that's when I apply color on my toe nails and natural polish for my finger nails. Why change all of a sudden? Well, I was able to grow healthy nails for almost 2 months while out of the country. And by the way, when I say healthy nails, I mean strong and thick. Plus, going to a runway show last Sunday, I felt the need of cleaning and coloring my nails instead of cutting them short. Came the next day at the grocery, I saw lots of nail polish in lovely colors which made me promise to do manicure and pedicure at least once a week. This nail polish is available in all leading department stores and groceries nationwide. Sorry.. I know it doesn't look like navy blue in photos. I tried taking pictures with and without flash, but the result is same. Waahhh! 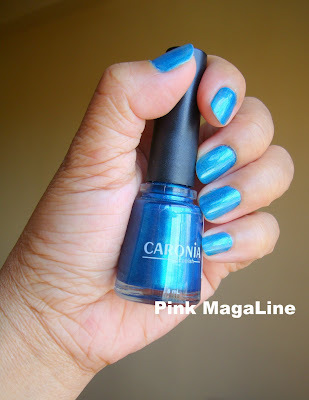 For the ladies who love nail painting and want to follow the blue nail polish trend, I think this nail polish is a good pick. It is affordable, dries quickly, and applies smoothly. Very bold colors! If I was younger I'll have those! I never tried a blue colored nail polish before. I usually go for shades in red. But that totally suits you. Nice! i never tried blue nail polish sis, i always used light pink, brown,dark brown and light brown. hindi kase bagay saken ang blue haha...pero sau bagay na bagay hihi. next time try mong lagyan ng design sis un ang uso ngayon eh. I love the color sis! Super nice. I like your nails sis...ako din always short yung nails ko...d kasi ako sanay na matulis yung kuko ko...ehehehe...the color looks great on your fingers!